After William Wissing, oil on canvas, James Scott, Duke of Monmouth (c. 1683). © National Portrait Gallery, London. James Scott (1649-1685) was the illegitimate son of Charles II (1630-1685) and Lucy Walter (1630?-1658), daughter of William Walter of Pembrokeshire. After Lucy began blackmailing Charles for annuity payments in 1657, Charles decided to have his son abducted and raised by his friend William, Lord Crofts (1611-1677), in Paris. In 1662 Charles summoned his son to England, where he joined the royal court at Whitehall. He quickly won his father’s affection. By the spring of 1663, James was married to a wealthy Scottish heiress and created Duke of Monmouth, among other honours and titles. After 1665, Monmouth enjoyed a prominent military career, serving in the navy under his Catholic uncle James, Duke of York (1633-1701), and, in 1672, commanding the army that assisted Louis XIV (1638-1715) against the Dutch. In 1678 he was appointed general of all the land forces in Britain. 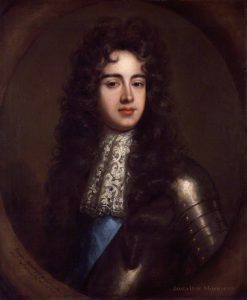 Charles’s fondness for Monmouth fuelled speculation that he would legitimize his son and thus make him successor to the crown. 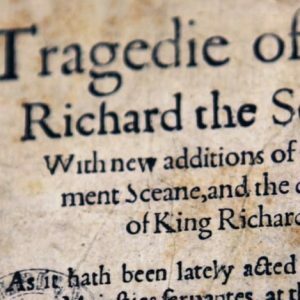 Amidst rumours of a ‘Popish Plot’ to kill the king in the 1670s, parliament mooted the idea of excluding the Catholic James from the line of succession. The protestant Monmouth would, if declared legitimate by Charles, make a suitable alternative king. Charles thwarted all attempts by the newly emergent Whig party to force through parliament a bill that would exclude James from the line of succession. Monmouth’s relations with his father and uncle broke down at this point. He intrigued with radical Whigs such as Algernon Sidney (1623-1683) with the intent of staging a coup. Although the plans came to nothing, their conspiracy was discovered by the government, and Monmouth had to go into hiding, with a reward of £500 for his apprehension. On 12 July 1683 he was indicted in absentia for high treason. 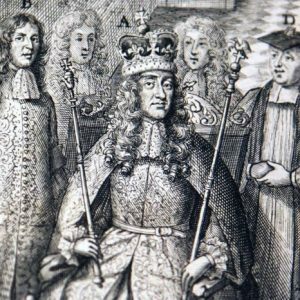 After months in hiding, and a failed reconciliation with his father, Monmouth fled to the continent where he received sanctuary from protestant heads of state including William of Orange (1650-1702). After Charles’s sudden death on 6 February 1685, Monmouth began plotting once again with exiled British dissidents. On 11 June 1685 Monmouth landed at Lyme Regis with three ships and eighty-three men. 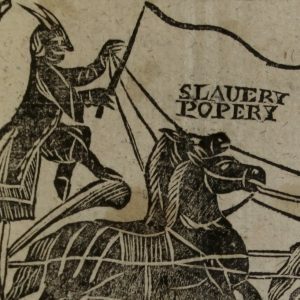 On the march through the West Country, Monmouth recruited an army. He intended to depose his Catholic uncle, claim the throne, and re-establish protestant rule. However, on 6 July his army was crushed by James’s and, two days later, Monmouth was captured. James was not merciful. He ordered that Monmouth should be executed for high treason on 15 July. The executioner botched the job. It reportedly took five strokes of the axe to sever Monmouth’s head from his body.